Picks for Girls Rock DC! This week at Steve Clayton, Inc., we had a really nice design submitted by a customer for guitar picks for his wedding. We wanted to write a blog about it, simply because the art is really cool! As you can see, the artwork includes a guitar, flames, roses, and the date of the wedding. The colors go really nicely together, and look awesome on our white delrin guitar pick material. The other side of the pick has the same design, but with the name of the happy couple instead of the date. Custom guitar picks can make a unique addition to any wedding. They are already pretty popular, but we want even more people to know about this option! This is why we have created a new website: customweddingpicks.com. This site is designed specifically to help out customers that are interested in custom wedding picks. We are always looking for more ideas to add to the site too! If you have photos of your custom picks from your wedding, or a cool wedding pick design like the one shown here, or have any questions about wedding picks, please write to us at weddingpicks@steveclayton.com. To start designing your picks, visit claytoncustom.com! I found this amazing article on Guitar Pick collecting that was done by The Ottawa Citizen. It incredible how popular and lucrative pick collecting has become. I love how they mention a $1,000 Johnny Cash pick going for sale on ebay. I love that since we worked with Johnny Cash for several years making him custom Black Acetal Custom guitar picks with his signature on them a long long time ago…. Read more here at a past blog posting. In 1986, Alex Golota picked up a Pat Travers pick from the stage at Barrymore’s. Today he has more than 700 picks from rock’s biggest names. The first guitar pick that Alex Golota recalls picking up — off the stage at Barrymore’s Music Hall, back in the mid 1980s when he did lighting at the Bank Street club — belonged to Pat Travers. The picks were initially an accompaniment to the 8×10-inch promo photos of musicians Golota collected as reminders of the shows he’d attended or worked; he would glue the picks to the photos and then have them framed. If he could, he’d get one or both autographed. As the years passed, Golota’s collection of picks grew. Some, like Travers’s, he picked up after a concert. Guitarists would sometimes give him one of their picks, or he would ask one of their technicians for one. 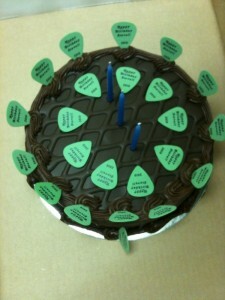 Friends in the sound and lighting trades, aware of his hobby, would acquire picks on his behalf. He has picks from some of the biggest names: The Rolling Stones, with their trademark tongue and lips; ZZ Top (both); one from Prince, via Jon Bon Jovi’s guitar technician and instantly identifiable by the unpronounceable “Love Symbol” he adopted as his stage name in 1993; a metal guitar pick from Def Leppard; Eric Clapton; Stevie Ray Vaughan; Buddy Holly; The Edge; a yellow pick that bears Alice Cooper’s name and likeness; and Avril Lavigne and Steve Earle, who each have skulls adorning their picks (his in green, hers in pink). “I recently got Jeff Beck,” says Golota, 51, “which is really hard to get because he doesn’t use a guitar pick. But I managed to catch up to his road manager on stage, and he has a bag of guitar picks that Jeff had 30 years ago, and he keeps them for real true fans. It actually says ‘This pick was stolen from Jeff Beck’ on it. He keeps his collection — 726 picks at last count, but growing all the time — in a pair of binders, one carrying the monogrammed and autographed picks, the other holding picks you’ll just have to take his word that they’re from who he says they are, like the Fender pick used by Bruce Springsteen. Curiously, perhaps, he doesn’t play guitar himself. But growing up in Old Ottawa South, his idols included Jimi Hendrix and Procol Harum’s Robin Trower. The first show he attended was an April Wine concert at the Civic Centre when he was 16. As he watched the roadies and technicians set up the stage be-between acts, he decided that was what he wanted to do for a living. Currently a lighting designer with the Canadian Museum of Civilization, where he’s worked for the past 18 years, he started out with Wall Sound, then moved to Barrymore’s. In between, he toured for two years as Stompin’ Tom Connors’ stage manager, and spent six months on the road with Charlie Pride. He takes his summer holidays during Bluesfest, where he does lighting and, with the help of the other techs, collects more picks. Last summer, he added 17 to his collection. The year before that, a record 48. “That’s my vacation,” he says. “The museum is so corporate — I have to wear a suit there most of the time. Some of the picks in his collection are definitely rarities. A pick used by Gene Simmons bears the KISS bassist’s thumbprint in theatrical blood. One that belonged to Jeff Smallwood — guitarist for Roch Voisine and Luba — is fashioned from a hotel room key card. He has a Spinal Tap pick used during a Canada Day show in St. John’s, as well one used recently by Crash Karma for a concert for Canadian troops in Afghanistan. Golota even has a pick used by NDP leader Jack Layton. Then there are the ones missing from his collection. He’s resigned to the fact that he’ll never own a Hendrix pick, while an online search for one used by Johnny Cash uncovered a $1,000 price tag, too steep for Golota. “These are actually rarer than stamps and coins,” he says, “because stamps and coins they produce hundreds of thousands or millions, but when a guitar player goes out on tour, he may only take 1,000 picks — a bagful. Over his career he may not buy another bag. So the rarity of these things is crazy. Visit ottawacitizen.com/million to see more photos and listen to Alex Golota, or to see past stories. Below are some pictures of them signing for all of their fans at our NAMM booth! We wanted to share with you that our endorsed artists Kyle Gass and Kones have a YouTube channel which they teach you how to play guitar! In this video http://www.youtube.com/user/Guitarings#p/a/E5965FD68668A3FD/0/vBffFLxPyCA they teach you how to play to “Tribute”. If you are looking for a very entertaining guitar lesson definitely check out their channel! They have had over 200,000 upload views to date, and over 1,800 subscribers. 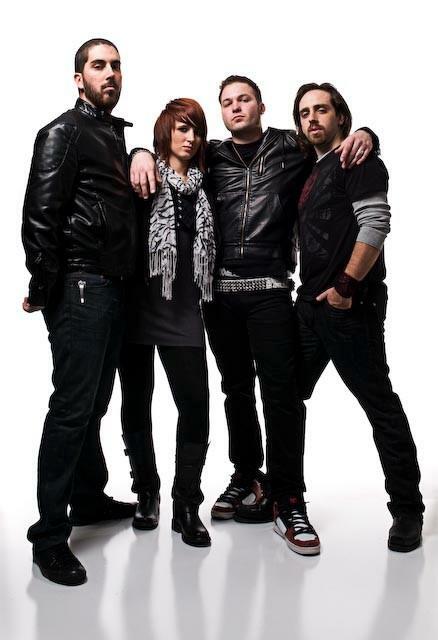 Band from Boston, Massachusetts signs with Clayton. Once Evan Shore, from the band discovered we do custom guitar picks he switched the whole band to Clayton custom picks. On 2004, the group released its first proper album, Beginner’s Muck, on their AMP label. This band was featured on MTV as they were the co-winners of Little Steven’s Underground Garage Battle of the Bands. Kim Fowler produced the band and they have had huge success since the start. We are so happy to endorse such a great rock band. Bring your rock to Steve Clayton’s custom picks like Muck and The Mires have! Just click on start now and get your custom picks today! For more information and shows for the band click on Muck and The Mires. We are excited to announce the new endorsed artists! 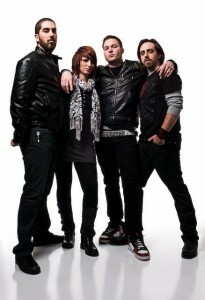 Chad Johnson And Down 1450 have become endorsed by Steve Clayton, check out their impressive website down1450band.com. A band that all started in Austin, TX make sure to turn the volume up for their music. The song “Take it Easy,” will bring a smile to your face after listening to it. Artist Blind Dog Cooley has joined the endorsement list here at Clayton. Jon Cooley bought his first electric guitar from earning money from his paper route back in eighth grade. His musical influence comes from blues artist Chuck Berry, Johnny Cash, and Omar and the Howlers. You can find more information about Jon Cooley through his website Blind Dog Cooley. Grab your coffee and enjoy the songs from Will McCranie. He has a great voice and a similar style to the Goo Goo Dolls. 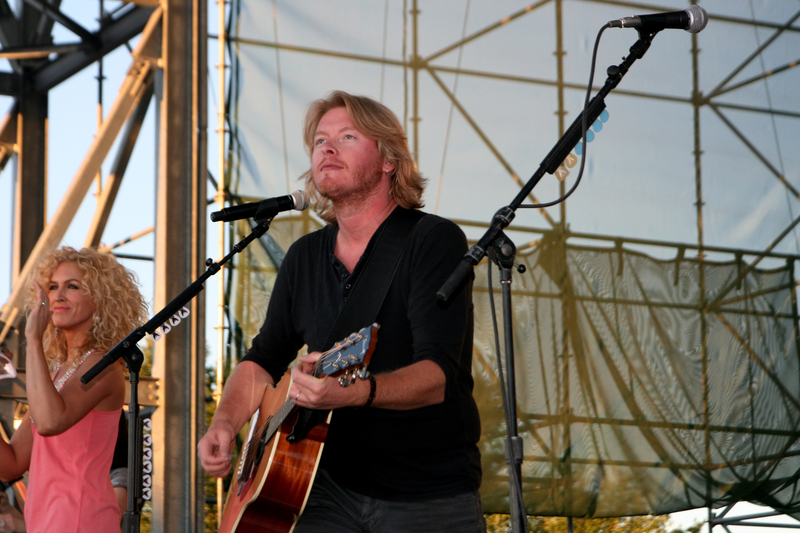 In fact, McCranie has actually opened for the Goo Goo Dolls. He said he stumbled upon our Steve Clayton picks in a music store and has since used them for about 5 years. We are happy to endorse such a talented artist and feel Will McCranie will be making it big in the near future. His 52/52 Project is impressive with one new song each week for the year of 2010. You can findout more at 5252Project.com. Check out his popular song titles “Everything” and “It Ain’t Like Georgia” on his myspace. Congratulations Will we look forward to following you this year! If you’d like to be endorsed please send us your band information through our endorsements online submission. We are excited to announce Christian D and the Hangovers have signed with Clayton. What a display of energy this band shows in their photos. You’ve got to see them live. You can find out where they are playing next right here by clicking on this link “Christian D and the Hangovers” They have been using our white pearl, .8mm rounded triangle shape, custom guitar picks. We look forward to making more picks for this fun band. If you’d like to be endorsed please submit your info here endorsements. What an amazing show we got to see here in Southern Oregon. Our new Jackson County Amphitheater is a perfect place for artists to perform. 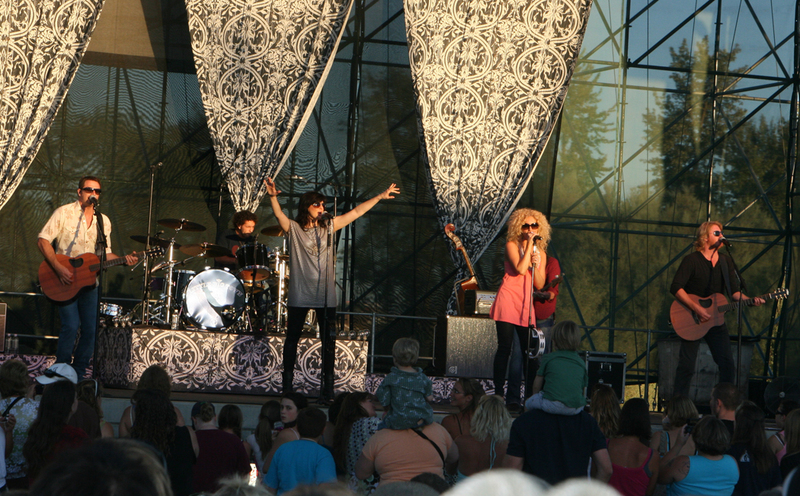 Last Tuesday, at the Jackson County Fair, Little Big Town invited us out to meet them and to watch their amazing performance. 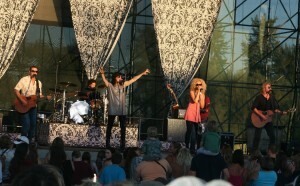 Thank you Mark Wheeler, and Bobby Simmons for working with us and Little Big Town to make it all happen. We look forward to making more custom guitar picks for these stars in the future. You’ll notice in the photo of Phillip Sweet, playing his guitar, you can see the clayton picks all over each microphone stand. At times Phillip would toss them out to the crowd. Phillip uses our .80mm acetal guitar picks, along with our frostbyte .94mm grip picks. Jimmy and Phillip expressed some new interest in our ultem guitar picks, which you can see in the picture also. Make sure to stop by our featured artist page from time to time as you may see these artists there soon. 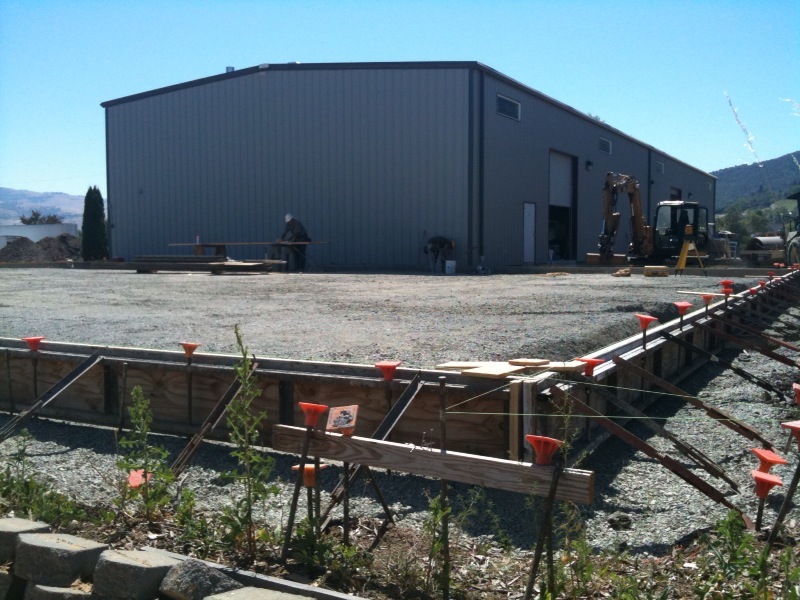 I just wanted to give an update on the progress of our new factory addition. In this picture you are able to see the forms going up next to our current factory. 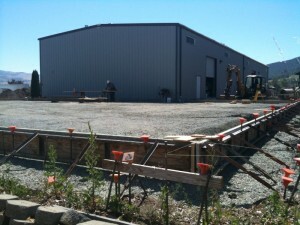 Soon they will be pouring the foundation, and putting up the new building! As their website states, “They are the swagger of the south, the energy of the sunset strip, the attitude of the borrows, and the dark side of bourbon street are just a few of the ingredients that make Blackwater James the new definition of rock n’ roll.” Dawn Greer Editor of Rock Music United says, “Blackwater James is definetly a great new band to be on the lookout for.” The band comes from the country capitol Nashville, TN. Despite the location they are definitely in the rock and roll genre and can be seen throughout the Nashville area. Make sure to stop by their website to see where they are playing. Tallboy has put out a new video we wanted to share that is demonstrating why their music is making quite the presence around here. This local Medford Oregon band is currently endorsed by us and we are happy to hear more of their rockin tunes. 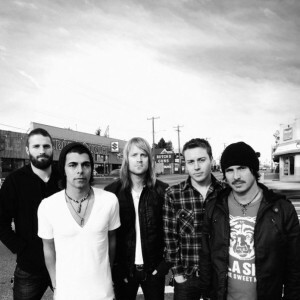 They are currently mixing a new album that is set to release in September. I just spoke with bassist Angel Alvarez and he has told me they have a lot of up coming shows fans need to see. July 21rst at Vibes, Shenanigans July 31rst, and the Medford Armory August 30th are all upcoming shows. You can find out more by clicking on TallBoy. Tallboy uses our orange and yellow custom delrin picks to play with while performing. They also love to throw them out to their fans to get them more involved with the show. You can find their picks on our facebook page for viewing. Enjoy the video! If you’d like to be endorsed too just click on our endorsement link and submit your information to us online. It’s new and simple, you can start here! The Classic Crime has now signed with Steve Clayton. We are excited to support such a talented band from the Seattle area. Vagabonds debuted as the #4 best selling Rock album on Itunes and was as high as #20 on the top overall 100 albums on Itunes. 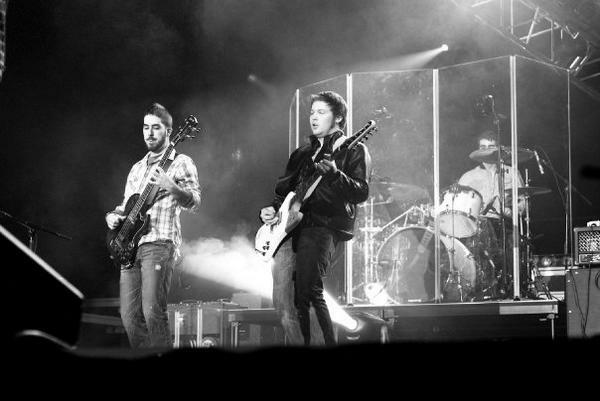 The band has nearly 10 million plays on Myspace. Bassist Alan Clark talks about why he chooses Steve Clayton Picks “I started using Clayton acetal triangle (.88 mm) picks 5 years ago when we started touring as The Classic Crime. The picks I was using before did not feel comfortable for my style of bass playing. I needed something with a little bit more surface to hold on to. The triangle shaped really helps because it doesn’t matter if the pick turns on me It’s the same shape all around. I’ve only broken one for the 5 years I’ve been playing them. I actually lose them or sign them for fans before they get worn out or break. 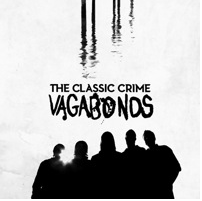 So I’ve never used them to their full potential.” If you would like to learn more about The Classic Crime be sure to check out their website http://www.theclassiccrime.com/. Fans Screaming For Steve Clayton Picks! 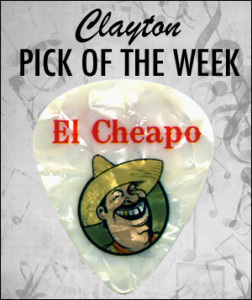 We just wanted to show you what the fans think about our Steve Clayton Picks. Music Makes Music shows why artists and fans can both enjoy our custom guitar picks. If you would like your fans to have the same reaction for your picks I’d suggest you get your rockstar Steve Clayton custom guitar picks. 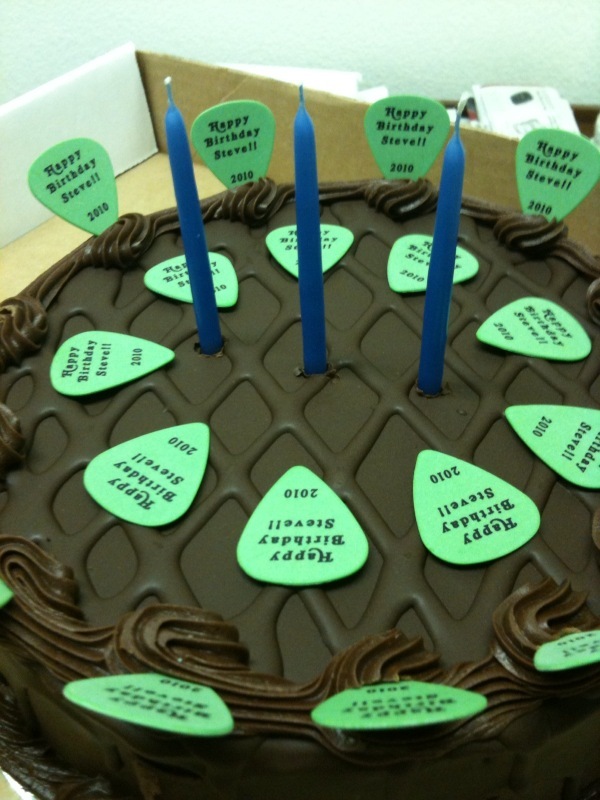 Photos, clip art, text, and all artwork can all be placed on our custom picks. Just go to steve clayton custom guitar picks and start your design today. Make sure to stop by and support our friends at Music Makes Music. This is a great program to get students involved with music to help them stay in school and graduate. This video was taken at one of their shows. The necklace was made for them also. 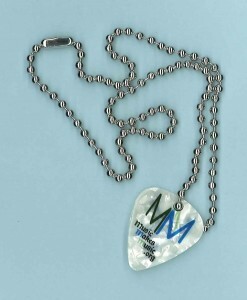 If you would like to have necklaces with your picks just give our customer service a call at 877.752.9484. 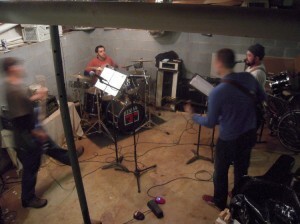 El Cheapo is a ro ck & roll cover band from Atlanta, GA fronted by “Stuff You Should Know” podcast host Chuck Bryant. They’ve been known to tear apart a basement or two and wake the neighbors in the name of a good time. After years of working day jobs, getting married and having babies, the band formed in 2007 under the original name The Cox Project. After toiling away for a year without a rhythm section, lead guitarist Eddie Cooper, bassist Chris Cox and Bryant landed a score in drummer Jim Issa, and El Cheapo was born. The guys use Fender and Gibson guitars and amps, and Tama drums. Their original Steve Clayton pick was inspired by their loud, fast and nasty brand of rock & roll, and love of cheap beer. They can be found in various basements playing for their pet dogs, or rocking the house of 40th birthday parties around Atlanta. Danny Miranda has signed with Steve Clayton and told us today he is currently touring with Meatloaf. Miranda chooses to play with our black raven rounded triangle .8mm and 1.0mm guitar picks. 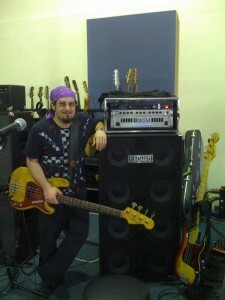 He has played are recorded with many big name bands such as Queen, Blue Oyster Cult, and Faith And Fire. Queen has produced 18 number one albums including their big hit “Bohemian Rhapsody” which was number one for nine weeks in the UK charts. Below you can watch his bass solo with Queen from a live performance in 2008. The Blue Oyster Cult’s music has been placed recently in video game soundtracks for Rock Band, Guitar Hero, and Shaun White Snowboarding featuring their hits. We are happy to support such talented artists. If you would like to be endorsed by Steve Clayton you may find out how through our contact information.